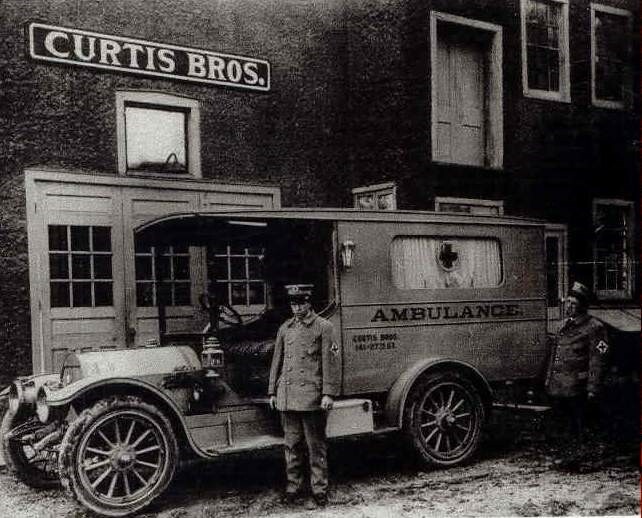 Curtis-Universal Ambulance, Inc. is the oldest private ambulance service in the United States and has been in the ambulance industry since 1858. The ambulance service at that time was operated by the Curtis family utilizing horse drawn ambulances and served Wisconsin’s oldest hospital, St. Johns Infirmary, now known as St. Mary’s hospital. The service remained with the Curtis family through three generations until 1950, at which time the Baker family purchased it. The Bakers have now owned and operated the service for the past 65 years and currently has the second generation of at the company. The first ambulance in the State of Wisconsin. The first Advanced Life Support ambulance in the State of Wisconsin. The first helicopter ambulance in the Midwest. The first neonatal M.I.C.U. in Wisconsin. The first private ambulance service in the State of Wisconsin to have all personnel registered and licensed Emergency Medical Technicians. The first private ambulance to utilize System Status Management in the State of Wisconsin. The first private ambulance service in the United States to be awarded a bid to provide paramedic services on an active military base. The first private ambulance service to provide a staffed 24-hour Registered Nurse A.C.L.S. transport ambulance for inter-hospital transfers in Wisconsin. The first private ambulance service in Wisconsin to have a Management Training Program. The first ambulance service in Wisconsin to have operations in other states. The first private ambulance service to adopt a mandatory Drug Testing Program. Revolutionized private ambulance service transport in Milwaukee in 1993 with the Advanced Concept Units. These special ambulances are working technology demonstrators and reflect what the ambulance of the future will be. Curtis-Universal is currently one of the largest private ambulance services in Wisconsin. Curtis-Universal Ambulance currently has operations in Milwaukee, and Madison, and through our affiliate Medix Ambulance: Racine, Kenosha and Walworth Counties. Curtis presently participates in the City of Milwaukee Emergency Medical Response System. Our response times have consistently averaged less than 5 minutes. The current volume for the E.M.S. system is approximately 1550 requests monthly and in the past has been as high as 1850 requests monthly. This volume represents approximately 60% of Curtis Ambulance’s Milwaukee call volume. Curtis-Universal provides ambulance transportation services for events at the Bradley Center. This will include all Milwaukee Admirals games, Petit Ice Center, South Shore Water Frolics. This also includes the Barnum and Baily Circus, concerts, and other events. Curtis-Universal has provided standby ambulance service to the Summer Sizzle Jazz Festival in Downtown Milwaukee’s third ward, Wonago Rodeo, MS Best Dam Bike Tour, as well as many others. Curtis-Universal provides standby ambulance services at local events like Midwest Speedway and The Rave (concert venue). Many standbys are provided free of charge to charitable organizations. Curtis Ambulance in the summer of 1989 began standby service at the Milwaukee County Zoo. Curtis staffed 1 E.M.T. with a custom designed gas golf cart ambulance, on a daily basis, and for special events such as Zoo Ala Carte, 2 ambulances with 4 personnel, as well as 2 EMTs with two golf cart ambulances. This provided EMS coverage for the over 2 million people each year that go to the Zoo. Curtis Ambulance currently holds the contract to provide ambulance transport services to the V.A. Hospital and has held this contract for over 10 years. This requires Curtis to provide long distance transport service, as well as, local and it is not uncommon for us to transport a patient to Milwaukee from Iron Mountain, Michigan and Chicago, Illinois. Curtis Ambulance currently operates in the Madison area. We are one of the first private ambulance companies in the state to have Critical Care Paramedics. We provide the majority of ambulance transport for Central Wisconsin Center, in addition we provided in the past a special neonatal transport ambulance to University Hospital, this unit was known as MedFlight/Cheta a dedicated ground transport unit. This unit provided transports in conjunction with University Hospital, Children’s Hospital and Medflight. Curtis Ambulance has provided standby ambulance service at special events such as Festivals of the Lakes, Home’s Rodeo, Impact Speedway, and Camp Randall, Tour De Cure as well as many others. We held the Camp Randall contract for many years. In fall of 2005 Curtis Ambulance acquired Medix Ambulance. Currently Curtis Ambulance is doing business as Medix in the localities that Medix Ambulance services. These localities include: Burlington, Lake Geneva, Delavan, Racine, Kenosha and the surrounding areas. This division operates private calls; ALS intercepts for several communities’ 911 services, first response Paramedic 911 services for a large section of Walworth County and a wheelchair van service. Medix is the primary service for many medical facilities in these areas such as Southern Wisconsin Center and Mercy Walworth Medical Center. Currently, the division has 24/7 Critical Care Paramedic transport available, and operates with some of the most advanced protocols in the State of Wisconsin. In February of 2008 the Medix Division successfully bid for The Town of Dover contract for EMS services. Working in conjunction with the Kansasville Fire Department, EMS services are preformed for the Kansasville Fire District. In an effort to control the costs of EMS a unique business model was incorporated including several shared resources, mutual understanding of the costs and shared decision making about the way EMS is provided to the Kansasville Fire District. In April of 2014, Medix Ambulance took over the Primary EMS services for the City of Delavan and the Town of Richmond from Delavan Rescue Squad which was in financial failure. Medix was able to stabilize the EMS system by entering into a public/private partnership similar to the Town of Dover. Curtis Ambulance started operations in Edgerton, Wisconsin in November 1998. Curtis provided 9-1-1 services to the Edgerton Fire District. Curtis was awarded the contract after demonstrating the cost savings of private public partnership, resulting in a cost savings to the community. The Edgerton, Wisconsin operation was an EMT-IV Tech skills service. Curtis Ambulance replaced AMR when the cost savings was found to be well over $300,000.00 annually. The call volume was approximately 600 annually. In the summer of 2008, Curtis was replaced by the Edgerton Fire District in the EMS role, and worked hand in hand with the Fire District to ensure a smooth and successful transition. Curtis Ambulance completed a three-year contract with the City of Jefferson and the townships of Aztalan, Oakland, Jefferson, Hebron and Sullivan to provide EMT-I level ambulance. Curtis Ambulance was the primary 9-1-1 service. This locality’s volume was 600 calls annually. Curtis Ambulance again replaced AMR in this locality when the cost savings was found to be well over $300,000 annually. During the Three years of service Curtis Ambulance was able to do better than projected and as such never raised the subsidy rates to the City of Jefferson. In addition, this was accomplished while upgrading the level of service.